Guernsey's sporting infrastructure is ready to host the 2021 Island Games, according to an inspection committee who have visited the island. The three-strong delegation spent the weekend in Guernsey, who are the only confirmed bidders for the event. "From a sport perspective we're very impressed with what we've seen," delegation member James Johnston told BBC Radio Guernsey. "At the moment we don't see any problem with the facilities." Guernsey has hosted the Island Games twice before, in 1987 and 2003. 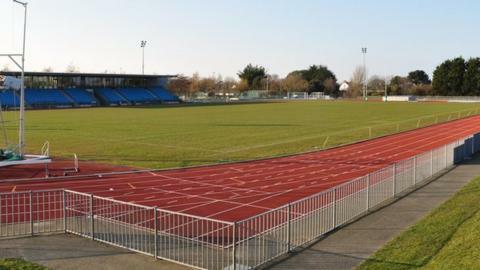 But while the sporting venues are up to scratch, Johnston said Guernsey had to be able to provide "suitable accommodation and appropriate finance" to cope with an influx of visitors. "The visit has been far more positive than I thought," Guernsey's Island Games Association chairman Brian Allen told BBC Radio Guernsey. "They've got immediate experience of hosting Island Games' in their own islands, and they've got real positive information that they've given to us about running a games. "Although we've done it in the past, they're more up-to-date than 2003, so it's been a very good couple of days." Gotland will host the 2017 Island Games, followed by Gibraltar two years later after the British Overseas Territory stepped in when Menorca pulled out of staging the event.